R&A chief Martin Slumbers has followed his comment that Brexit was causing "significant concerns" for The Open at Royal Portrush by saying it will be "one of the great sporting events". 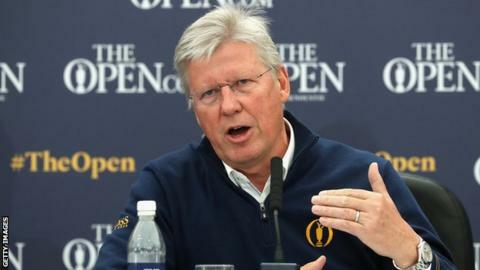 Slumbers spoke on Tuesday of the logistical headaches a possible no-deal Brexit was causing the R&A. However, the R&A chief released a further statement on Wednesday. "There is no doubt in my mind that it is going be an historic occasion," said Slumbers of the 18-21 July event. "We are determined to deliver an outstanding Championship at Royal Portrush and stage the biggest ever sporting event ever to be held on the island of Ireland. "It is a privilege to be bringing The Open back to Royal Portrush for the first time since 1951 and we are all looking forward to it very much. "We are working with our partners and the local agencies in Northern Ireland to stage a fantastic Championship of which everyone will be proud." Organisers from Royal Portrush are confident that the County Antrim venue will stage a "first-class experience" in July. "I think everything is as ready as it possibly can be," said chairman of the Royal Portrush Open Championship Organising Committee, John Bamber. "When you look into a crystal ball you have to be prepared and I believe that the R&A and Royal Portrush, the infrastructure that we're putting in around this Open Championship is prepared for just about anything and everything - Brexit included." Slumbers' comments on Tuesday at a news conference held to announce that Royal Liverpool would host The Open in 2022 led to banner newspaper headlines in Northern Ireland on Wednesday. The R&A chief executive said the organisers would "make it happen" but admitted he would be happy when the sold-out event was over. "We are concerned that we start building in April," Slumbers told BBC Sport on Tuesday. "What will be the situation? Will there be any border or not? We need some certainty. we need to know what rules we need to comply with. "We have developed multiple contingency plans. We've advanced some, deferred others, but like every business we're trying to work contingency plans into an uncertain environment." "We have over 2,000 containers, some from as far afield as the Middle East, to get across the Irish Sea and we start building on 2 April. "It doesn't threaten the staging, we will make it happen. It's just more complex than we anticipated. "For the insiders it's a bit harder but for everyone outside it won't impact at all, they won't notice."